The U.S. Bureau of Reclamation, an agency of the Department of the Interior, is one of the principal water management agencies of the federal government. Reclamation was established in 1902 to "reclaim" the arid and semiarid lands of the seventeen western states for settlement through the development of irrigated agriculture. * Over the past century, however, the agency has evolved principally from a developer to a manager of water resources. 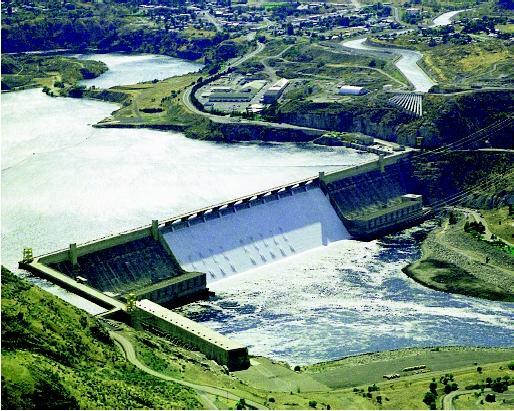 Grand Coulee Dam in Washington state is the largest U.S. Bureau of Reclamation dam and reservoir in the Columbia River Basin. It was completed in 1942.
to store sufficient quantities of water to ensure that a reliable water supply was available for irrigated agriculture. From 1902 to 1907, the Bureau of Reclamation began about thirty projects in the West to provide water for irrigation. Over time, however, it became clear that Reclamation dams and reservoirs could meet other needs as well, and multipurpose projects were developed to provide for flood control, municipal water supply, and hydroelectric power generation in addition to irrigation. The construction of the Hoover Dam, completed in 1936, was Reclamation's first major multipurpose project. The Central Valley Project in California and the Columbia Basin Project in Washington soon followed. The heyday of Reclamation's construction program began during the Great Depression (1929–1939) and continued through the 1970s. As of 2002, the Bureau of Reclamation operated about 180 water projects, totaling some 600 dams and reservoirs. It is the largest water wholesaler in the country, bringing water to more than 31 million people and irrigating 10 million acres of land. Nearly 140,000 farmers in the West receive water from projects operated by the bureau. These farmers produce 60 percent of the nation's vegetables and 25 percent of its fruits and nuts. Reclamation also operates 58 hydroelectric power plants, generating more than 40 billion kilowatt-hours of electricity annually, enough to serve 6 million homes. In addition, every year more than 90 million people visit 300 recreation sites created by Reclamation projects. The needs of the West have changed greatly since the early 1900s. Many of the rivers have been overallocated and are straining to meet all the needs that have been identified. While irrigation remains the principal user of water in the West, rapidly growing cities, Native Americans, recreation interests, and environmental protection needs are all demanding their share. This reflects the new western water landscape, and few new federally funded dams are likely to ever be built, owing to the high financial costs and environmental and other concerns. Without the ability to develop new water supplies to meet all the identified needs, Reclamation must attempt to secure water through other means, in particular through better water management. Reclamation's current program focuses on encouraging water conservation and water reuse, and developing effective partnerships with all water users. Reclamation's mission statement, "to manage, develop, and protect water and related resources in an environmentally and economically sound manner," gives no indication of the complexity and contentiousness that exists in trying to achieve a delicate balance between all the competing needs for a limited supply of water. SEE ALSO Agriculture and Water ; Army Corps of Engineers, U.S. ; Conservation, Water ; Dams ; Hoover Dam ; Irrigation Management ; Planning and Management, History of Water Resources ; Supply Development ; Tennessee Valley Authority . Robinson, Michael C. Water for the West, the Bureau of Reclamation 1902–1977. Chicago, IL: Public Works Historical Society, 1979. U.S. Bureau of Reclamation. Written in Water. Washington, D.C.: U.S. Bureau of Reclamation, 1998. "A Brief History of the Bureau of Reclamation." U.S. Bureau of Reclamation. <http://www.usbr.gov/history/borhist.htm> . * For a regional map of the Bureau of Reclamation's responsibility, see <http://www.usbr.gov/main/what/regionalmap/index.html> . The main fact which led agriculture to be the largest water users in the world is because of the methods they use to irrigate their vegetations, most are still in use of old methods, like the use of pipes, sprinklers which spray water fo more than 3 meters high, the high the water goes the more it get lost. Those methods should be revised and improved so that water will be used effectively.There should also be forrows in agri fields to conserve running water during irrigation, so that water will be conveyed to water sources and used again. application of ferterlizers should also be taken into consideration, our people applies more nutrients to their plants, which are often noticed in water sources, during irregation those chemicals applied are washed into rivers and contaminate our raw water. Such water required more treatment and many treatment processes leads to more water loss.